Starting with e-Learning? Start with Easygenerator. It now offers all basic functions you need for authoring, publishing, sharing and capturing results. When you are a beginner in e-Learning you have to cover a lot of things before your learners can actually start learning. 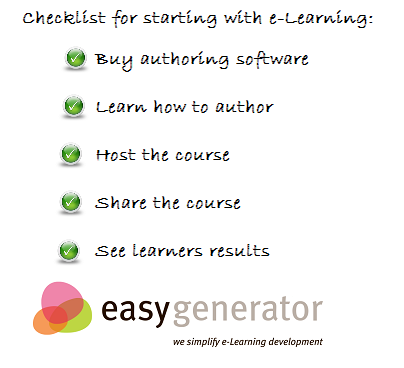 Easygenerator is an e-Learning authoring environment that now offers you all this and more! Starting at e-Learning? Start with easygenerator! Easygenerator is an authoring environment, but with some additions. You can sign up for easygenerator and start in seconds, it is easy to use (no training needed) and you can use it for free if you want. Easygenerator is web-based, so you do not even have to install anything. You do not need to take a training. We have created Easygenerator with the starting e-Learning developer in mind. It has an easy and intuitive interface. Just start authoring. Using the tool is one, but how do you create effective learning? Easygenerator has a built-in didactical approach that will help you to create a better and more effective course based on learning objectives. It offers support in the form of free webinars en Q&A meetings and it has an e-Learning course on how to create effective e-Learning. You will find that creating an effective course is very different from creating a PowerPoint presentation, but it is not that difficult. When you have created the course you must find a place on the web to place. But what if you don’t have a learning management system or website? Easygenerator offers you course hosting as well (for free!). You can publish to our server with one click. Your course will get a unique link that you can share with your users through mail or Skype. If you have a website you can use this link to link to the course from your website. You can even embed a course in your website, as easy as you can embed a YouTube video. Easygenerator automatically captures your learners results. They will appear in your authoring environment without any effort from you. Easygenerator has four plans ranging from Free to Academy and you can up or downgrade every month (without losing any courses). Prices range from $0 to $59 per month, no charge per learner, only a subscription for each author (course creator). Click here for detailed info. Previous DevLearn evaluation: The gap is widening: We are in a crisis! Next Merry Christmas and a happy 2015!